Bedford's train and rail links to London, Brighton and the North of England. Bedford has two railway stations, the main station is Bedford Midland Station and the smaller station is Bedford St John’s. Bedford has good rail links to London, Brighton and the North of England via Derby and Sheffield. Bedford Midland Station is located on Ashburnham Road, MK40 1DY and is highlighted on the map below. Govia Thameslink Railway, East Midland Trains and London Midland Trains run trains from Bedford Midland Station. Three train services operate from Bedford. Govia Thameslink Railway services run to Brighton via Flitwick, Harlington, Luton, St Albans, London St Pancras, London Blackfriars, East Croydon and Gatwick Airport. 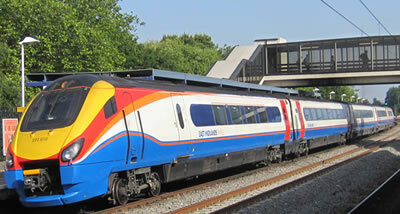 East Midlands Trains operate between London St Pancras and Corby, Derby, Sheffield and Nottingham calling at Bedford, Wellingborough, Kettering, Market Harborough and Leicester. The Marston Vale Line runs to Bletchley via Bedford St Johns, Stewartby, Lidlington, Ridgmont and Woburn Sands. You can view a rail network map for this area which gives a complete list of stops. Bedford Midland Station has over 450 parking spaces including 44 double-decker parking spaces. 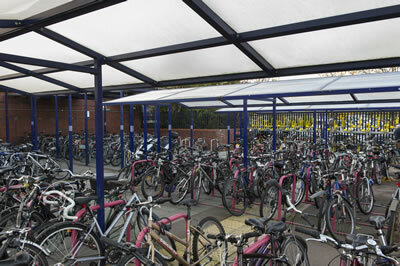 Cycle parking can be found to the right of the main entrance, along the path into the station and in the south car park. The majority of this parking is undercover. Sadly in the past there have been some security issues with cycle parking at this station. There is CCTV coverage of the cycle parking and the British Transport Police regularly have a presence at the station. However it is strongly recommended that you follow the guidelines for locking your bike which can be found in the bike security section. St John’s station is located on Melbourne Street, MK41 9AN. There is access to the station through Melbourne Street car park or down some steps from Ampthill Road. This railway line is known as the Marston Vale railway. The Marston Vale railway is a small rural railway running through the heart of the beautiful Marston Vale countryside between Bedford and Bletchley. As well as being the main public transport link in the area, the hourly train service provides access to jobs, schools, and leisure facilities in the Marston Vale. London Midland provides the rail service that runs from Bedford to Bletchley and the Marston Vale Community Rail Partnership help run and promote the railway line. Bedford St John’s has sheltered cycle parking for 8 bikes in Melbourne Street Car Park. It is recommended that you lock your bikes securely following these guidelines . Bikes are also accepted on Marston Vale Line trains at all times. The single-carriage trains have spaces for two bikes at one end of the train (denoted on the outside by the cycle logo). The two-carriage trains have tip-up seats where you can store your bike. Bikes can also be stored in the doorways with the permission of the conductor. Goes from/to Town Centre – Bedford Hospital – Elstow Park and Ride. It is a 15 minute walk from Bedford St John’s to Bedford Bus Station. Bedford St John’s does not have a ticket machine in the station, when you get on the train the conductor will be able to sell you a ticket which you can purchase using cash or credit card.